Another week (and weekend) are over. Haven’t felt like there’s been enough hours to get everything done! So i sat and watched Sherlock tonight- part 1- and I have to say I love it. Maybe not more than I love Jonathon Creek. He reminds me of him and I think thats a lot of the reason I like it. Definitely worth a watch- I have to say I was a bit sceptical but I think it works well the way they’ve done it. Got another week working at The Crack and then a friend is coming back up this weekend for a visit, so we’re planning a bender in Ncl and then something nice on sunday. That’s if we don’t have too much of a sore head! It’s Liberty and was the remnants of a roll so i got it for £1.99….such a bargain. 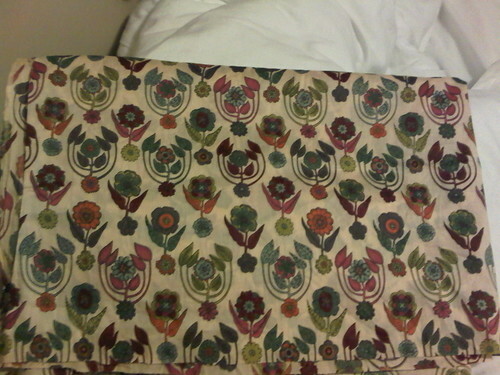 The fabric will make such a nice top- that is when i get around to making it. I just havent found the time yet. Oops. Or this sort of shape…. I love the yellow gingham just as much as I love the shape – although this is not a good picture to show the shape of it as its blowing up rather than lying how it should. I do have buttons for my top too- gorgeous little mother of pearl ones- but I’m thinking I want them going down the back of it rather than the front. now I just have to make sure I get it done before my holiday!! p.s If you have not seen either of those films…. (first two stills are from Breathless and the second is from Vicky Cristina Barcelona) then I would definitely recommend them. I really enjoyed Vicky Christina Barcelona, it's been awhile since I watched it but I think I liked Penelope Cruz' outfits the most. 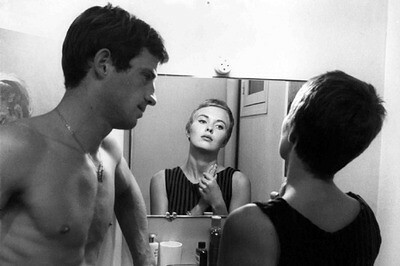 I haven't seen Breathless but whenever I see stills from it I want to push myself to finally watch it – Jean Seberg makes short boyish hair look so good. I've never seen "Vicky Christina Barcelona" but it seems to be a very great movie ! Lovely to see a fellow Uk blog! Love that fabric, very retro! I am following this blog now, would love you to follow/check mine out too!!! I love Vicky Christina Barcelona! One of my favs! yes to buttons on the back, and YES to that fabric. You are too cute! Lovely blog, by the way. And I'm so envious of you that you can sew– I went through the motions of trying to learn and it didn't quite happen. Great Blog! Love that vintage fabric! Pretty! Your fabric is lovely – I can't wait to see how the top looks! 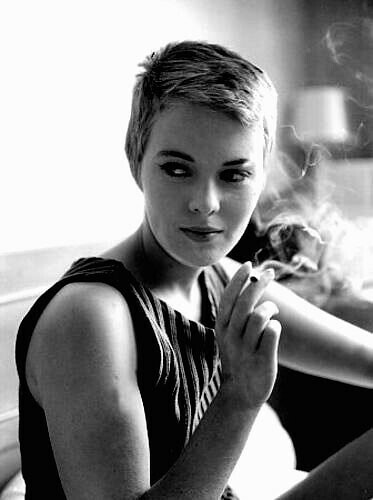 Love Jean Seberg…and your liberty fabric is such a great find. I love it. I agree with the beginning. I find myself asking, where did all the time go? I wish I didn't have to sleep. That would definitely give me more hours in a day!! Thanks for your comment. Sorry, but I don't have those movies.